For quite some time there have been lots of discussions and ideas on an additional playing surface in Colemanstown FC; many negotiations fell apart and resumed, partial plans were drawn up, pondered on and subsequently withdrawn over the last number of years. 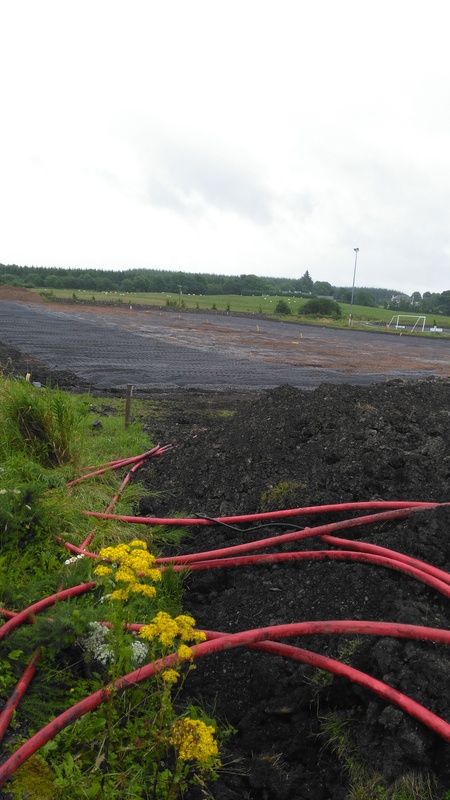 But eventually, O’Connor plant hire moved in to Colemanstown soccer pitch last week with their heavy machinery to begin works on our much needed 2nd playing pitch for the club. Diggers, dumpers, tractors etc have moved in on the existing sand training pitch and ground staff expect the hallowed turf to be in tip-top condition by the end of the season. The old sand pitch has now been removed, the old sod neatly stockpiled, additional drainage installed and the pitch will soon be ready for the best quality topsoil and reseeding. In order to fund this work, we urge all players, parents, members and everyone who has ever had an association with the club to sign up to our 50:50 draw – past supporters, helpers, players, committee, managers, coaches etc. Not alone will you be supporting our development but you have the added bonus of winning a healthy sum of money on a monthly basis. A sincere thanks to everyone who has supported us in the past; in whatever form – we are most grateful. The club will post photos and progress reports on the club website and/or the clubs facebook page so members and supporters far and near can keep up to date with progress and see the new pitch materialise from the comfort of their homes. Keep a close eye on our club website to see more …….